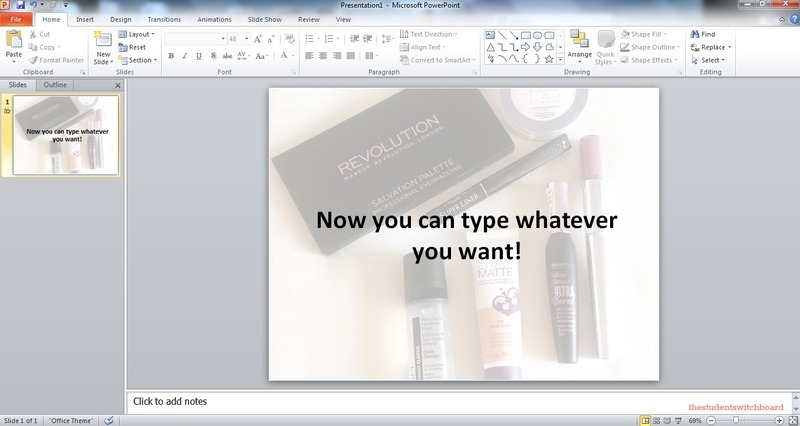 PowerPoint presentations are now a pretty standard part of work and student life. Whether it’s at school, college, university, or even when you’re applying for a job (that’s right, a lot of interviews now include a presentation element! 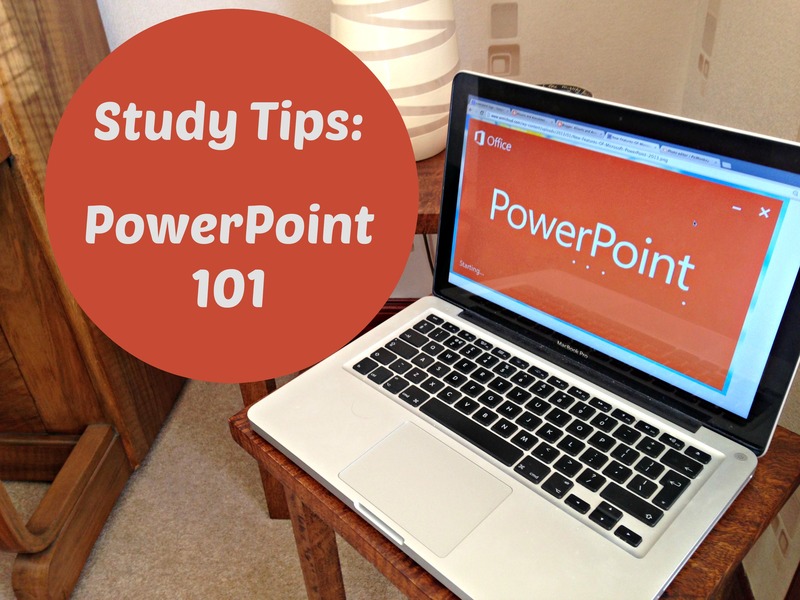 ), knowing how to put together a few slides on PowerPoint* is something we all have to master. Most of us are now taught the basics at school – how to add and delete slides, insert text or a picture and play the slideshow. 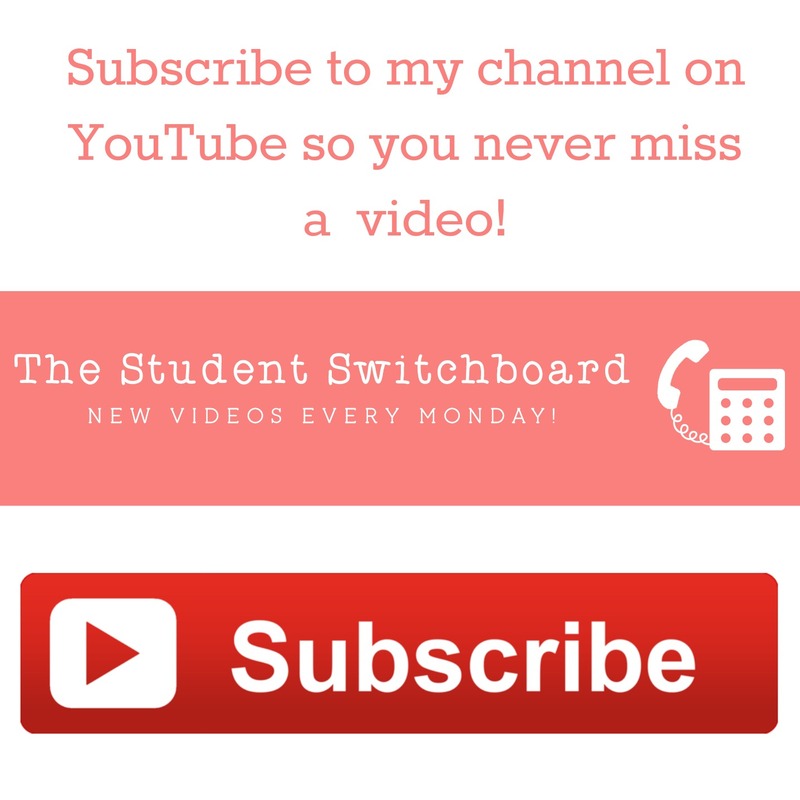 However, if you want your presentation to really pack a punch, and stand out from your classmates, I thought I’d give you a couple of tips that I’ve picked up, to help you achieve just that! *These screenshots were taken on PowerPoint 2010 – the setup may vary in different versions e.g. 2007, 2013. 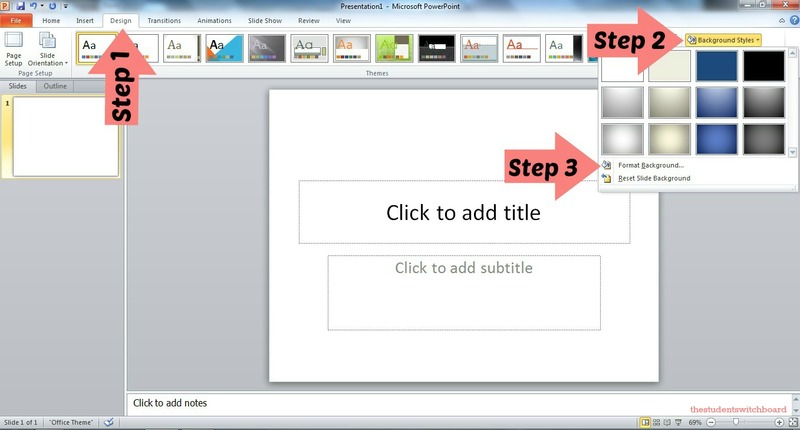 Step 1: Open up your presentation, and click the “Design” tab along the top of the screen. Step 2: Click on “Background styles” at the right hand side of the screen. 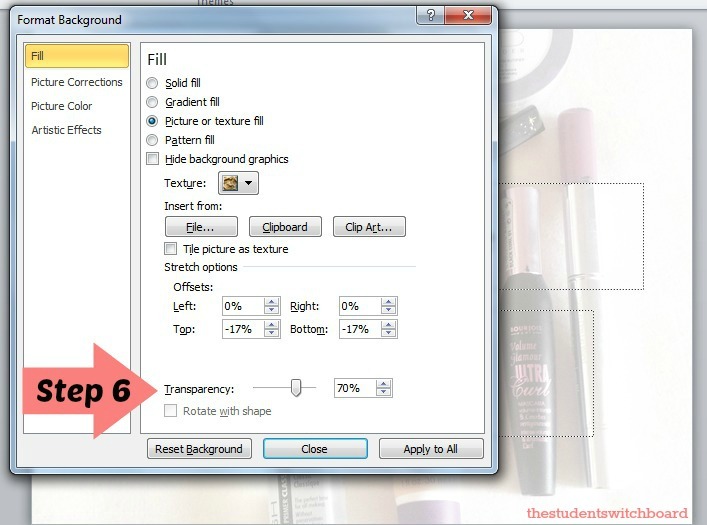 Step 3: Select “Format Background”. Step 4: Select “Picture or texture fill” on the Fill tab. Step 5: Select “Insert from File” and choose your image. However, depending on the photo you upload (in this example I’m using one of my Instagram photos of some makeup – let’s say I’m doing a presentation on the beauty industry! ), you might find that when you try to insert your text, it becomes difficult to read. Fear not, there is a quick and easy way to fix this! 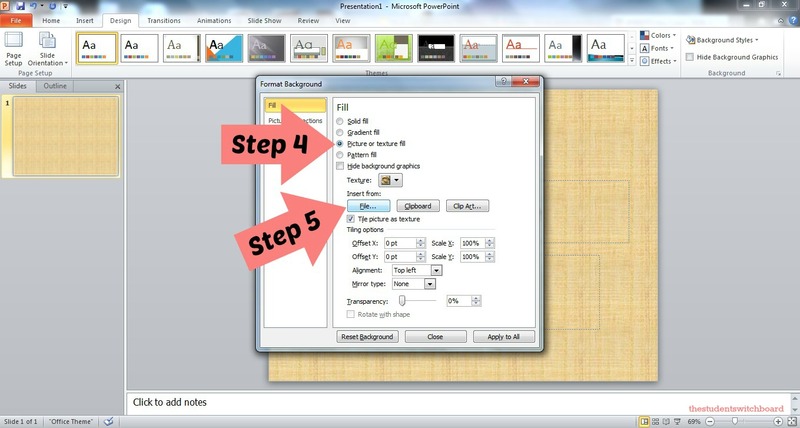 Step 6: Jump back on to the format background tab you clicked on in step 3. At the bottom of this box, you’ll find a “Transparency” bar. Adjust this as much or as little as you need depending on how busy/dark your chosen image is! Now you can type as much text as you like and it should show up nice and clearly! If you want to take it one step further, however, you can add an additional layer by editing the text box itself! Step 7: When you click on your text box, the “Drawing Tools” bar should appear at the top of your screen. Click it. Step 8: Click on the “Shape Fill” dropdown box and select “More Fill Colours”. 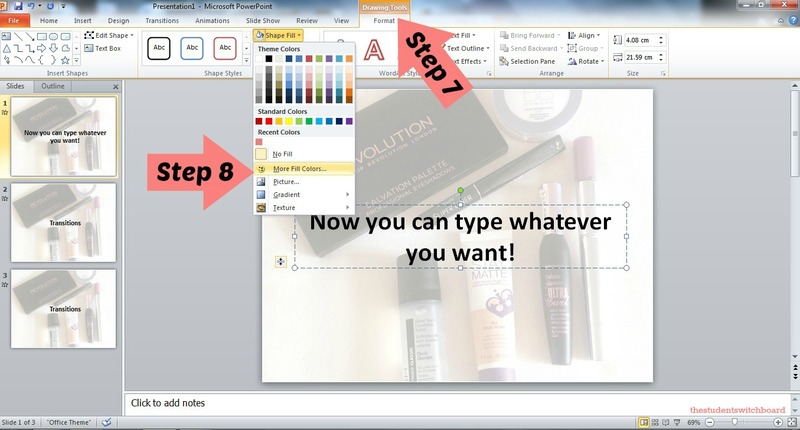 Step 9: Choose from the standard colour tab (which provides all the standard set colour options on PowerPoint) or Custom. By choosing custom, you can change the RGB colour if you have a specific colour scheme in mind. 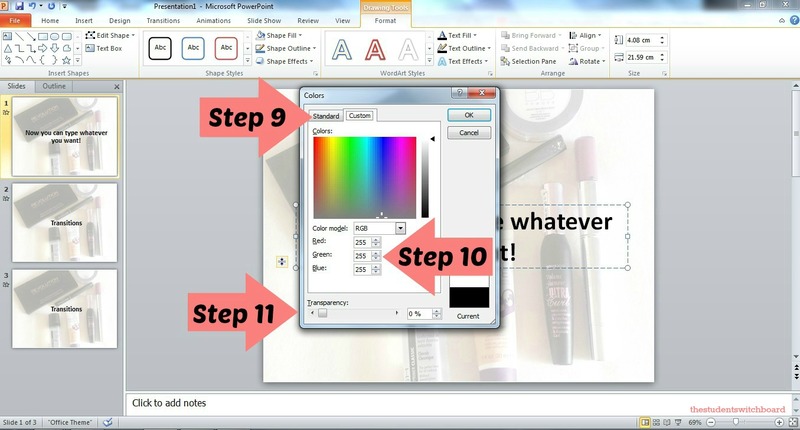 Step 10: This step only applies if you have chosen the custom colour option! Type in your RGB codes, or play around with the colour by clicking on the rainbow box on the tab! Step 11: After all that effort getting your custom background uploaded, you might not want part of the image to be totally blocked out by your textbox. 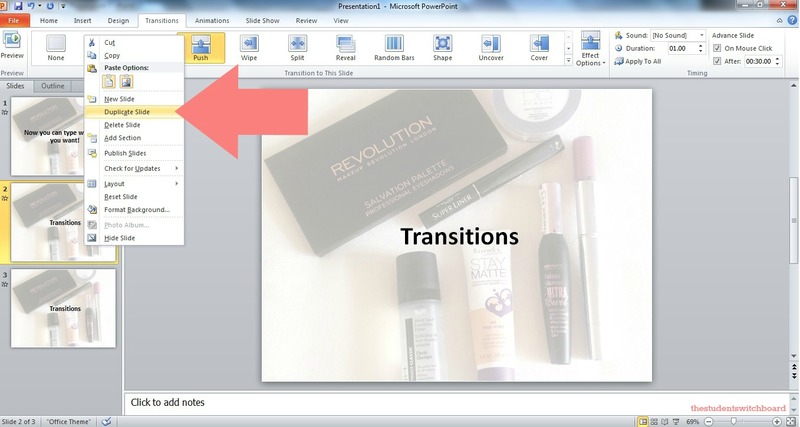 Again, PowerPoint has a handy little Transparency bar for you to adjust, so that your image can shine through as much or as little as you’d like. And here’s another little tip… to repeat this background on every slide, if you make a design you are really happy with, just right click on the slide in the sidebar and hit “duplicate slide”! 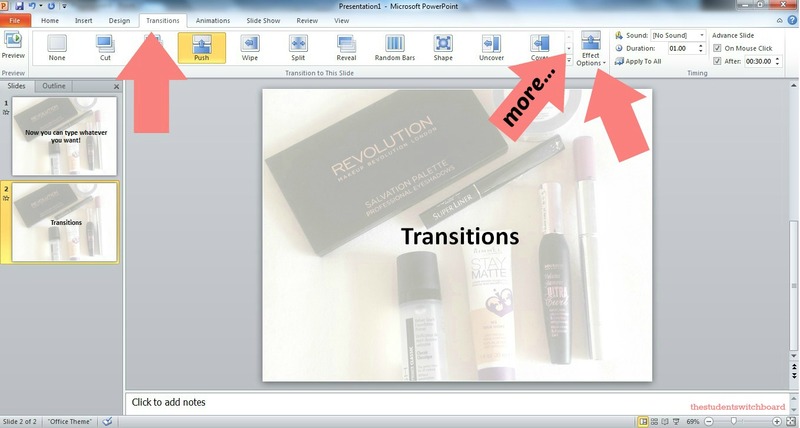 Finally for today, a quick word on transitions between slides! There is nothing wrong with the set transition, which just relies on you clicking the arrow on your keyboard to move to the next slide. In fact, sometimes the simpler the better is a good rule to go by! 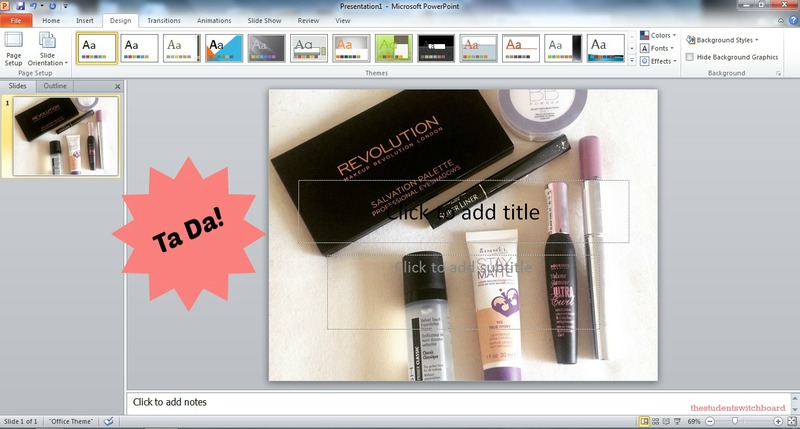 However, if you are after something a bit fancier, PowerPoint has a few options! Click on the “Transitions” tab along the top of the page. Here you’ll find a number of options, from fading out of one slide and into another, to a checkerboard effect – just click the little arrow at the side of the bar to see more than the first few options! Then, if you’d like to change the effect (from sliding left to right, to right to left etc), click on the “Effect Options” dropdown box. 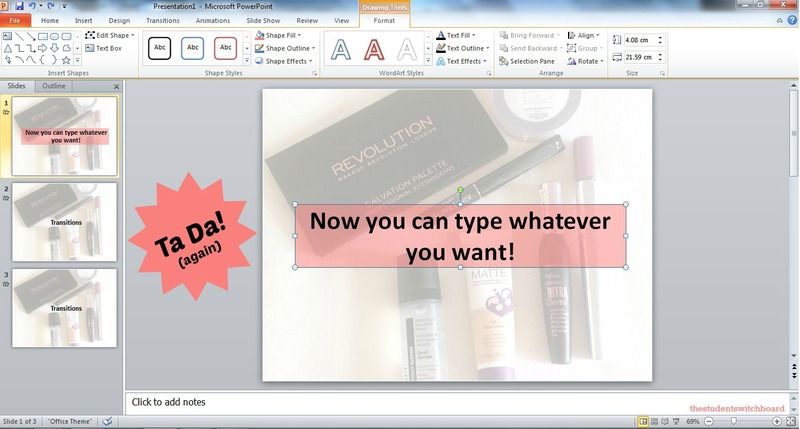 So that’s it for my PowerPoint 101 – just a few tips to help make your next presentation stand out from the crowd! I have lots more of these (I spent A LOT of time using PowerPoint during my Masters), so if you’d like to see more of this sort of post, let me know in the comments! I might do a version on Prezi, which is a different presentation program online, so let me know if that would be of interest! Hope you’re having a lovely week! What are some of your tips for creating a powerful presentation? Aahhh!! Thank you! You have no idea how hopeless I am at PowerPoint and I have a big presentation this semester, so THANK YOU!!! Where was this post when I started Uni 3 years ago?! `I just had my last ever Uni presentation last week hopefully thats me done for a while, but this post is super useful and I wish I’d known these things before. I once got marked down because my powerpoint was boring! I was exactly the same – I went through my entire undergrad not knowing this, and only discovered it all during my masters! !